❤ Any issues with DIGI-YOUNG KEY FINDER, Pls feel free to ask us, We will try our beat to give you a great service! 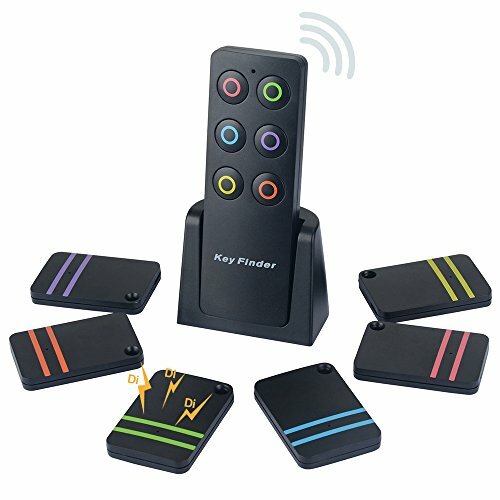 This key finder 6 wireless item finder can help you find your belongings that frequently lost, like keys, remotes, purse, glasses, canes umbrella etc. Just press the button on the transmitter, the beeping sound will lead you to your lost items! 1. Support up to 100ft: Radio frequency can penetrate through walls, floors, cushions, leather, etc to help find your item up to 100ft away. 2. Loud beep up to 80dB: The loud beeping sound can up to 80dB. Just press the button on the transmitter, the beeping sound will lead you to your lost belongings. And the blinking red flashing light will also help you find items in dark areas. 3. Multifunctional: The receivers can be attached to key, mobile phone, wallet and luggage etc, almost all the important items in personal life and work are feasible. ❤ PERFECT PRODUCT: 6 KEY FINDERS: attach the receives to any 5 items and simply press the number buttons to locate them. Easy to use and operate. It can be used as key finder, phone finder, wallet finder, pet finder, anything finder. ❤ EASY TO OPERATE: Just simply press the color-matched buttons on the transmitter (remote) , the beeps sound from the key finder/receiver will lead you to find the lost item. Additionally, the receiver has a small and soft LED light that helps to find items in the dark. ❤ HIGH PRECISION QUALITY: 100ft range -- Radio-frequency signal can penetrate through walls, floors, cushions, leather, etc to help find your item up to 80 feet away . Perfect for use indoor or in the garden and yard .Each tracker weighs only 0.35oz, Easy to carry and use. Receiver sounds/beeps, leading you to your lost item, Up to 80dB beeping sound wireless range in open area! Super convenient and helpful in your daily life! ❤ UPGRADE QUALITY BATTERIES & LOW CONSUMPTION: Life up to 6-12 months with an easily replaceable CR2032 battery. The key locator is with built-in efficient sound driver chip and volume is upgraded.Upgrade quality batteries, long lasting, not easy to run out. Contact our customer service for any quality problems. ❤ EXTENDED 1 YEAR WARRANTY: DIGI-YOUNG provides an extended 12 months warranty so you don't take any risk. Modern design with black Color, a great gift to forgetful person, elders friends, etc. You can also attach it to find your baby cats and dogs at home if yo want! No more hide and seek! If you have any questions about this product by DIGI-YOUNG, contact us by completing and submitting the form below. If you are looking for a specif part number, please include it with your message.